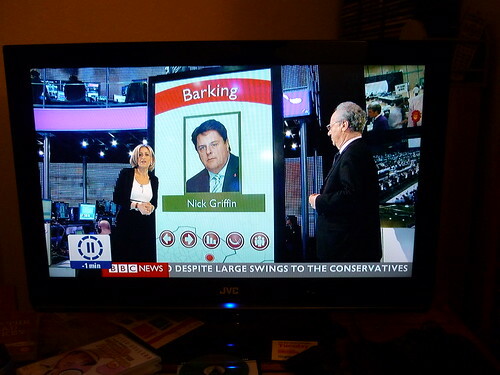 Quite impressed how many people have looked at my photo of Nick Griffin on Flickr. 430 so far with one person adding it as a favourite and someone else inviting me to add it to an anti-Nazi group. The only sensible thing to do is to turn it into an LJ icon, hence <----. I've Creative Commonsed the original photo so feel free to pinch it It's quite nice to have a period where politicians are trying to say as little as possible. If only it was always like that. I think Rupert Murdoch might be getting a shock that people don't actually like what he wants and they're harder to control than his newspapers and TV stations. Of course he could apply for British citizenship and vote like the rest of us.